Can a Serum Biomarker Predict Response to Immunotherapy? 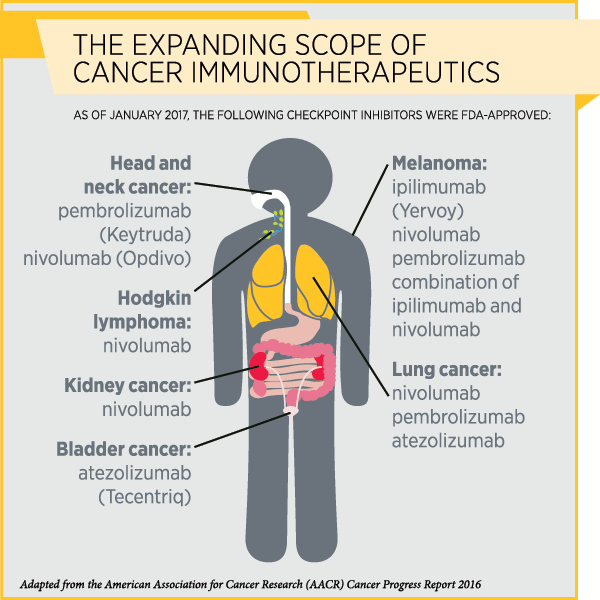 Immunotherapy, particularly a class of immunotherapeutics called immune checkpoint inhibitors, has transformed the treatment of several types of cancer in recent years. So far, the U.S. Food and Drug Administration has approved immune checkpoint inhibitors to treat a variety of cancers, including melanoma, Hodgkin lymphoma, and cancers of the lung, kidney, bladder, and head and neck. By blocking certain proteins, immune checkpoint inhibitors release the “brakes” on T cells so they can attack cancer cells. The immune checkpoint inhibitor ipilimumab (Yervoy) releases the brakes on the checkpoint protein CTLA-4, while therapeutics such as pembrolizumab (Keytruda) and nivolumab (Opdivo) remove the brakes on the checkpoint protein PD-1. Although immune checkpoint inhibitors have been providing remarkable, durable responses in some patients with a variety of cancers, only about a quarter of patients with these cancer types respond to these drugs. The next step in trying to increase the proportion of patients who respond to these therapies, therefore, is to understand who responds and why. There have been efforts to identify effective biomarkers of response, but validating them has been a challenge. For example, researchers are studying whether the protein PD-L1 could serve as a biomarker of response to therapeutics such as pembrolizumab and nivolumab that target the PD-1/PD-L1 pathway. PD-L1 is often present on tumor cells or certain immune cells in the tumor microenvironment, and binds to PD-1 (or applies the brakes) on T cells and prevents them from functioning. But because of the dynamic nature of PD-L1 (meaning, the levels of this protein could vary during the course of the disease), compounded by the heterogeneity of the tumor (meaning, different areas of the tumor could have different composition) leading to errors with tissue sampling, efforts to pin this protein down as an effective biomarker have not been very successful. 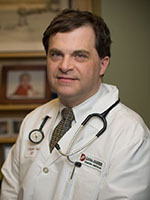 One approach to tackling this problem is to identify serum biomarkers that can be measured and monitored with ease, says F. Stephen Hodi, MD, director of the Melanoma Center at Dana-Farber Cancer Institute, professor of medicine and investigator at the Ludwig Center at Harvard Medical School in Boston. Hodi and colleagues published a paper in the AACR’s journal Cancer Immunology Research, in which they studied the role of angiopoietin 2 (ANGPT2), a protein related to angiogenesis (blood vessel formation), in immune regulation and its potential as a biomarker for immune checkpoint inhibitors. “Serologic markers may provide a global assessment of immune activation and provide an immediate snapshot in the dynamic process,” the researchers wrote in the paper. Hodi’s team found that serum levels of ANGPT2 predicted response to, and influenced the outcomes of, immune checkpoint inhibitors in patients with advanced melanoma. They also noted that ANGPT2 may serve as a target for combination therapies of inhibitors of immune checkpoint and angiogenesis. ANGPT2 is a regulator of blood vessel maturation and enables angiogenesis. In prior studies, this protein was associated with resistance to treatment with bevacizumab (Avastin), an antibody therapeutic that targets another angiogenesis factor, VEGF. In this study, co-funded by a Stand Up To Cancer – Cancer Research Institute Cancer Immunology Dream Team Translational Research Grant, the investigators studied serum samples collected before and within three months of treatment initiation from three sets of patients with advanced melanoma treated with the anti-CTLA4 antibody ipilimumab, ipilimumab plus bevacizumab, and the anti-PD1 antibody nivolumab or pembrolizumab, respectively. Patients were from three different clinical trials in which survival data were available. About 17, 20, and 37 percent of the patients in the three studies had complete or partial responses, and the median follow-up time for all of them combined was 33 months. The researchers found that among patients from these three studies, the median overall survival in those with high levels of pretreatment serum ANGPT2 was significantly longer than those with low levels of the protein prior to treatment. In order to understand whether changes in serum ANGPT2 levels with treatment influenced clinical outcomes, the researchers computed the fold change of the protein levels before and during treatment and found that those with high pretreatment ANGPT2 levels but large fold changes had the worst survival, and those with low pretreatment protein levels but small fold changes had the best survival. Patients with high pretreatment ANGPT2 levels and small fold changes and those with low pretreatment ANGPT2 levels and large fold changes had intermediate survival. This correlation between the dynamic serum ANGPT2 levels and survival consolidates the role of this protein as a prognostic biomarker. The researchers went on to investigate the mechanism by which ANGPT2 influences clinical outcomes and, in their laboratory experiments, found that ANGPT2 increased the expression of PD-L1 on a specific subset of macrophages that promote immune suppression, tumor promotion, and metastasis. “These in vitro studies suggested that angiogenic factors not only play a role in blood vessel formation in tumors but also have immune-regulatory effects; therefore, therapeutics that inhibit angiogenesis could synergize with immune checkpoint blockade,” Hodi says. The investigators are conducting a phase I trial testing a combination of tremelimumab (an investigational CTLA-4-targeted immune checkpoint inhibitor) and an ANGPT2 antibody in patients with advanced melanoma. Why Does Immunotherapy Not Benefit Everyone Long-term?